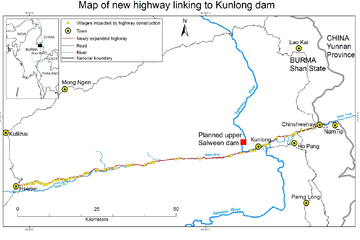 The 1,400 MW Kunlong dam on the Salween River would irreversibly destroy a unique ecosystem and the livelihood basis for many villagers. The project faces strong opposition from civil society groups and activists. The Salween River (also known as Thanlwin, or Nu river) remains one of the few largely untouched and free flowing rivers in the world. It is a unique river ecosystem as well as a livelihood source for many villagers from different ethnic groups. A series of hydropower plants proposed to be constructed on the Salween river in Myanmar would change this irreversibly. The Kunlong dam (sometimes also referred to as Upper Thanlwin dam) is one of them and has caused substantial concerns among affected villagers, civil society organizations (CSOs) and others over heavy social and environmental impacts [1,2,3,4,5,6]. A memorandum of understanding was signed for the Kunlong project in 2007 between Gold Water Resources (China), Hanergy Holding Group (China) and the Ministry of Electric Power (MOEP), followed by a memorandum of agreement in 2010 to start project implementation . In 2013, the government announced that in total, six hydropower dams were approved on the Salween river: the Naung Khar, Mann Taung, Mong ton, Ywathit, Hatgyi and the Kunlong dam . Construction activities had started already for the Kunlong dam; however, they had to be stopped in 2015 due to heavy fighting between Burma troops and Kokang armed forces, during which more than 100,000 civilians had to flee to bordering China . According to officials , the project was then delayed over security concerns. The dam construction has caused large social and environmental concerns. 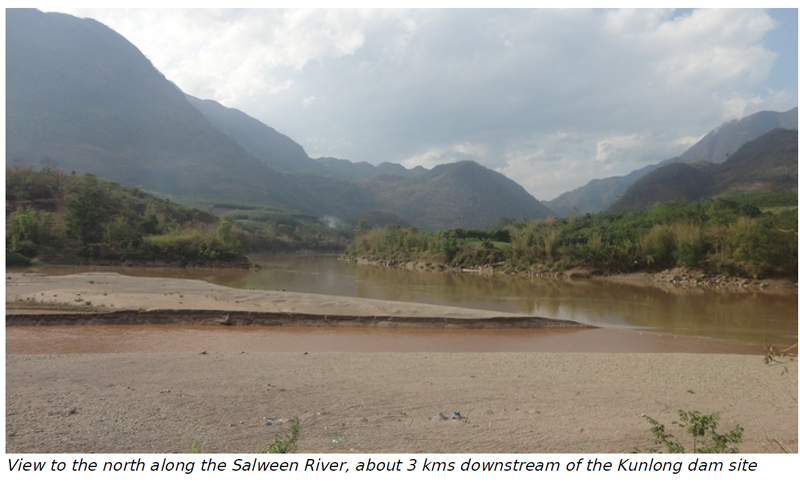 As all other dams located on the Salween driver, the Kunlong dam would disrupt the current ecosystem and the livelihoods of local people relying on it. People living in the reservoir area will have to be relocated and downstream villagers would be affected through changing water flows that may harm agricultural and fishing practices [1,3]. According to the CSO Shan Human Rights Foundation (SHRF) , the construction of the access roads conducted since 2012 had led to large land confiscations and environmental impacts such as contamination of water sources, in absence of compensation payments. 60 villages with a population of 20,000 people have been affected, said SHRF  and Salween Watch . According to a representative of the Hydropower department [quoted in 7], four villages will be flooded if the dam is built. SHRF and other civil society groups also fear the hydropower project threatens a fragile peace process and leads to further militarization, as the dam is located in a conflict zone [2,4]. The hydropower project has faced strong opposition. Civil society organisations call for a stop of construction plans [1,3] and more generally, for a moratorium of large dams in Myanmar [4,8]. Hydropower is highly controversial in Myanmar because of the many concerns over heavy social and environmental impacts, their construction in conflict areas, and the frequently improper consultation and compensation procedures [4,8]. The Irrawaddy reported that in 2014, more than 60,000 people and 131 civil society groups have signed a petition against the six planned dams on the Salween driver . 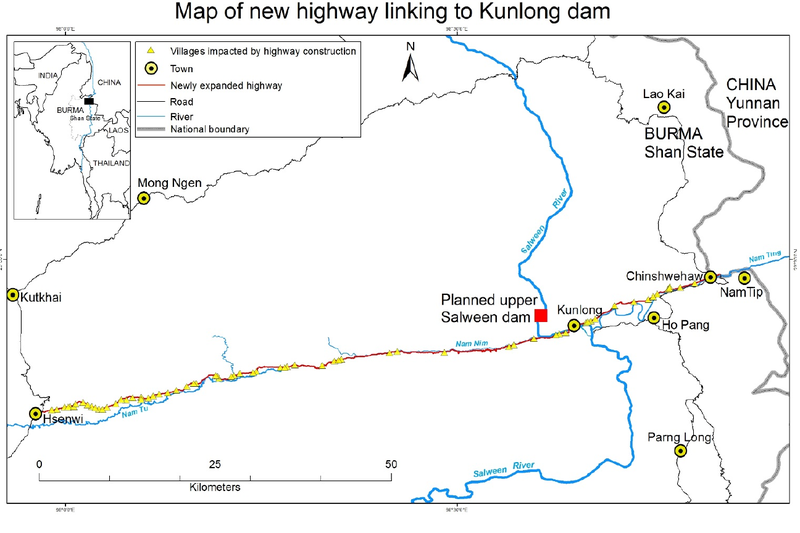 Project Details The Kunlong dam is located about 7km upstream from Holi village, Kunlong township, in Norther Shan State . The hydropower project is one of the largest in Myanmar developed in a joint venture with foreign and domestic companies . Planned capacity amounts to 1,400 MW [1,2,4]. About 90% of the electricity produced is planned to be sold to China through the China Southern Power Grid [2,4,7,8]. According to an article in the Myanmar times , the involved companies are Gold Water Resources (China), Hanergy Holding Group (China) and Myanmar’s Asia World Group, which is involved through a partnership with Hanergy Holding Group. According to The Irrawaddy , Asia World is a Burmese conglomerate owned by US-sanctioned tycoon Steven Law. News stated that Hydrochina Kunming Engineering carried out the feasibility study and that Biodiversity and Nature Conservation Association (Banca) from Myanmar and Khiti Engineering Institute from China conducted the ESIA surveys [7, see also 1]. According to SHRF , Asia World is carrying out the construction at a cost of 1.4 billion USD. Reports say, if implemented, the project would displace 418 people from four villages in Kunlong Township, Shan State . Relevant government actors Ministry of Electric Power, Myanmar. Impacts from road construction were not compensated, according to SHRF . Government officials say that plantations lost to the reservoir have been compensated . Project temporarily suspended over security concerns . Why? Explain briefly. The project was temporarily delayed over security concerns as it is located in a conflict area. Plans for construction have not been cancelled. Burma Rivers Network on the Kunlong Dam (accessed online 03.05.2018). Salween Watch, 2014. "Hydropower Projects on the Salween River: An Update" (accessed online 03.05.2018). Shan Human Rights Foundation (SHRF), February, 2014 "Large-scale land confiscation for Salween dam infrastructure in northern Shan State" (accessed online 03.05.2018). "Myanmar’s toxic legacy of large dams". Article by Beth Walker, The Third Pole, 14 March, 2017. (accessed online 03.05.2018). The Myanmar Times, 9 July 2015 "Kunlong hydro project delayed over security concerns" (accessed online 03.05.2018). The Irrawaddy, 20 June 2014 "Govt Pushes Ahead With 3 Salween, Irrawaddy Tributary Dams" (accessed online 03.05.2018).